All 457 visa holders must meet condition 8501 which is “adequate health insurance” arrangements. To understand how to meet this condition its important to break this information into two sections. Those looking to apply for a 457 visa from offshore and those 457 visa holders currently residing in Australia. When applying for a 457 visa you must show proof that you meet the 457 visa health insurance requirements. This means that you MUST show proof that you have DIBP compliance health cover that meets their criteria irrelevant of the country you reside in. 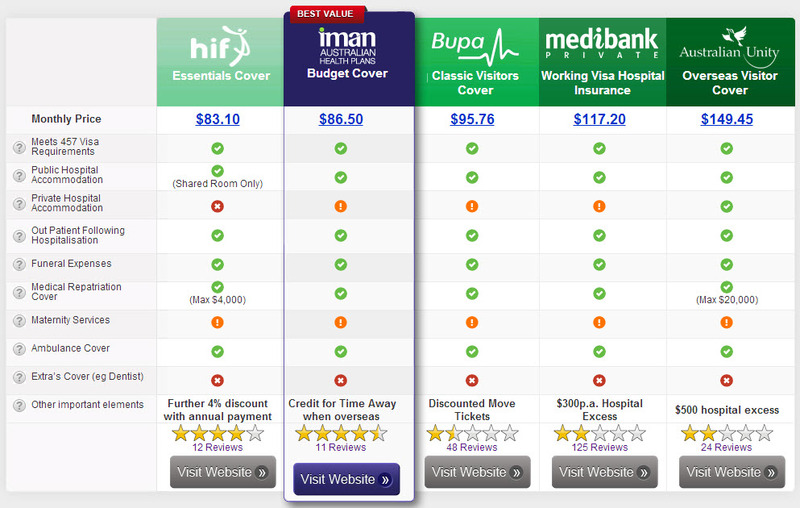 Below is an example of some budget 457 visa health insurance policies for singles. If you click on the picture you can then navigate to other comparison tables based on price an your situation (eg couples, families, etc). When a purchase of any of the policies above are made a proof of purchase is sent through within 24 hours. This e-mail or letter must be attached to the application form as proof you have met the 457 visa health insurance requirements. The only exception when making an application offshore is for Irish residents who may be able to show their passport as proof of meeting this requirement due to a unique reciprocal relationship they have with Australia. This though does not apply to any other country such as the UK even if they also have a reciprocal agreement with Australia. Once an individual, couple or family come to Australia they must continue to meet condition 8501. These 457 visa health insurance requirements though could be met through Medicare if the resident holds a passport of a country that has a reciprocal agreement with Australia. UK, Belgium, Finland and Italy. For a full list view the Human Services government website. It is critical that 457 visa holders from these reciprocal countries don’t cancel their 457 visa health insurance until they receive their Medicare card otherwise they will have a period where they don’t meet condition 8501. While Medicare will provide some basic services it won’t cover many aspects such as ambulance trips or certain procedures. If you require these services they may lead to a significant out-of-pocket expense so it’s worth talking to your insurance provider first before letting your policy lapse. For visa holders who do not come from a reciprocal agreement country such as China, USA and India, you must keep your 457 visa health insurance consistently during your stay. You may change health funds or policies during this duration as long as your remain covered during the handover. The government has made sure that switching between funds is relatively easy and any waiting periods incurred during the past policy will be moved across to the new one. This means that shopping around each year to ensure you have the right policy to meet your needs is a wise move. As part of the 457 visa application you must meet some minimum health requirements which differ by citizenship. You can view the 457 visa health requirement page for more details on these requirements.